← Edward P. Norvell. Ocracoke between the Storms. Winston Salem, NC: Distributed by John F. Blair, 2013. M. S. Cole. Southern Conflict. Kernersville, NC: Alabaster Books, 2011. Many of us have learned about the textile industry in North Carolina from history books or family stories. Mill village housing, segregation of the workforce, stretch-outs, time-and-motion studies, company stores, strikes, blacklisting–all of these are known to us as pieces of history. 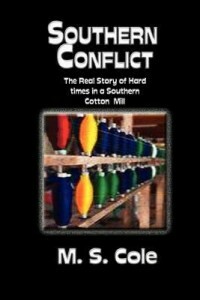 Southern Conflict brings that history to life through the story of the Turner family. One small mill house is home to the Turners– two children and five adults. Four of the adults work in the Banner Cotton Mill that dominates the little village of Pine Valley. Emma Lee, who presides over the household, used to work in the mill too, but she now stays home to raise two children who have been abandoned by their mother, one of Emma Lee’s cousins. Emma Lee thinks she knows mill work, but it is Aunt Elle, who at 72 still works in the mill, who has seen it all. But maybe not. It’s the 1950s, and some winds of change are beginning to blow. When the owner tightens the screws at Banner Cotton Mill, the workers organize, even to the point of reaching across the racial divide. Owner Isaac Banner pushes back, and there is violence and retribution. Each member of the Turner family member is touched by what happens. How they think about the mill and their lives, and the actions they take, may prompt readers to have fresh ideas about North Carolina’s industrial and social past.